What makes a 4-H Project, a Champion Project? What is a 4-H Project? What is a 4-H Project? According to the official 4-H definition, a 4-H project is a planned series of learning experiences of six hours or more within a particular area of interest. The purpose of a 4-H project is to promote mastery of subject matter and to foster life skill development (i.e. communication skills, citizenship, leadership, good decision-making, and goal setting). Every 4-H member is required to do a project each year. We will utilize the Shooting Stars 4-H Club’s butterfly garden to express the key dynamics of impactful 4-H project (Florida 4-H, 2014). 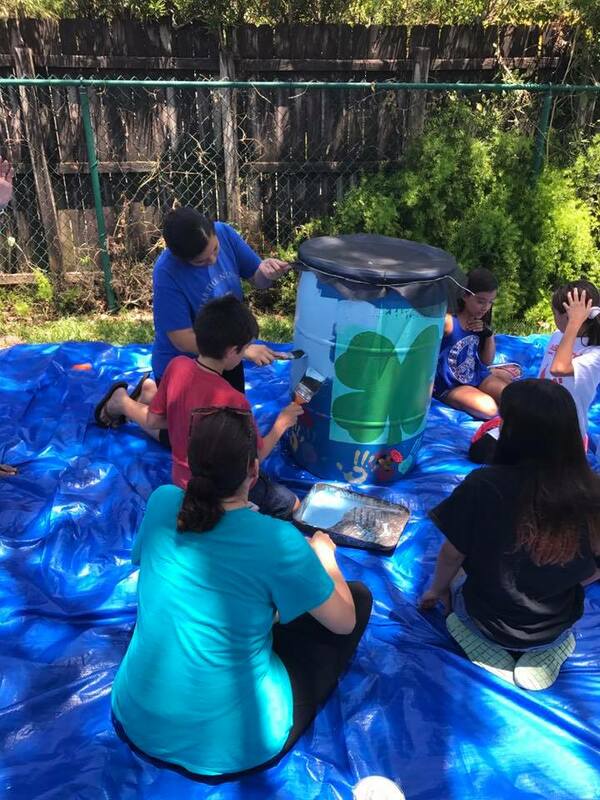 Shooting Stars club members preparing a rain barrel. The Shooting Stars 4-H Club is a group of 4-H members that meet regularly at Larry and Penny Thompson Memorial Park. The group has been a charter club for the past 8 years and is led by Elizabeth Murialdo. Each year, the club selects a 4-H project. In the fall of 2016, the Shooting Stars decided to learn about pollinators and construct a butterfly garden at the Bella Luna Retirement Home. The 4-H members wanted to create a garden to be admired by the tenants and bring awareness to the community about the importance of pollinators to our environment. The youth conducted research on pollinators, attended workshops, and received instructions on landscape design. 4-H members, parents, and club leaders received funds and donations of plants from various nurseries in Miami-Dade County. Presentations and workshops were given by the 4-H members to the community as an outlet to share their knowledge. Experiential Learning: The 4-H project must be a commitment of mastery (six or more hours). One of the key ingredients of 4-H mastery is becoming knowledgeable on the subject matter of one’s project. Before beginning the project, the 4-H members educated themselves on the environment and various Florida friendly plants suitable for butterflies in South Florida. The group sought guidance from experts such as Lorna and Danny Bravo, who are champions at educating the community on Monarch butterflies and constructing butterfly gardens. 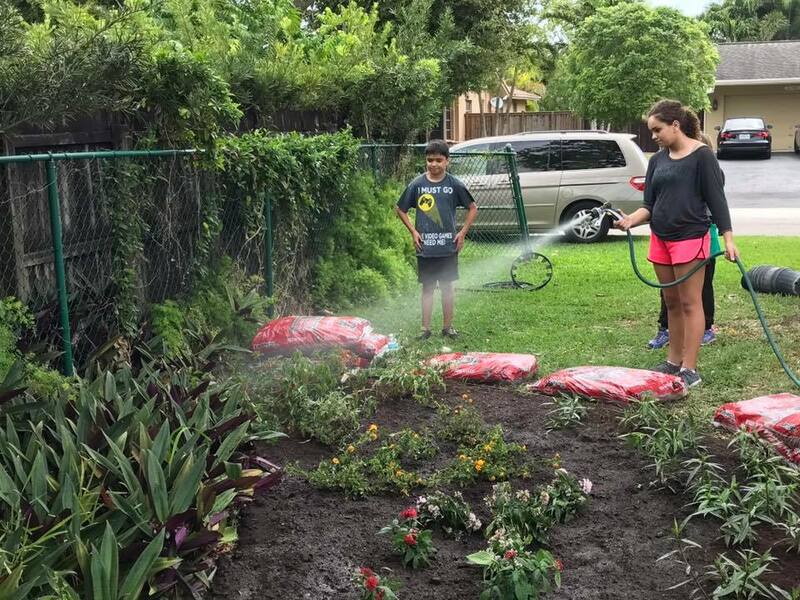 The University of Florida/IFAS Extension Miami-Dade County Florida Yards and Neighbors shared with 4-H members “The Nine Principles of Florida Friendly Landscaping,” which addresses topics such as the right plant in the right place, water efficiency, smart application of fertilizers, etc. This expert guidance assisted the youth to move forward with the project. Citizenship: Element of Community Service Related to 4-H Project. The members of Shooting Stars 4-H Club wanted their 4-H project to be educational, as well as a community service project. They decided to locate the garden at a retirement home, so the residents would be able to visit the garden on their daily walks. In addition the 4-H members have the opportunity to visit with the residents and leave them with a caring smile. Exhibition: Presentation(s) of a 4-H Project. The 4-H members of the Shootings Stars are required to give a presentation on the butterfly garden and share before a body of people what they learned and how they executed their objectives and goals. The exhibition process gives youth the opportunity to become more confident in their ability to communicate with others about their ideology and world. The mediums in which they present are at club meetings, youth fairs, events, and workshops. The Shooting Stars also took their knowledge and exhibit skills to a competitive level by participating in the Miami-Dade Youth Fair’s landscape design competition in 2017. One of the beautiful aspects of the 4-H experiential learning model is that we encourage youth to partner with an adult to assist them with the development of their project. “Youth-adult partnerships take place when youth and adults plan, learn and work together, with both groups sharing equally in the decision-making process” (Murdock & Costa, 2017). The adult acts as a mentor, coach, and/or advisor to the youth. They keep the youth accountability, so the members are aware of the responsibility to finish whatever they start as a 4-H member. In the case of Shooting Stars 4-H Club, Elizabeth Murialdo and leaders allow the youth to decide on the direction of their club and give guidance on goals that may not be obtainable for the group. In addition, the adults keep the youth motivated to keep pushing through the mundane task of “weeding” a garden, so they reap the rewards of the elderly members seeing a monarch butterfly fly around their bedroom window. Throughout the year, the 4-H Club or 4-H member follows guidelines or a 4-H project book. The youth are completing activities and logging their progress. Once a project is completed, the individuals fill out a 4-H project report generated by Florida and submit it to the 4-H office for approval to receive 4-H project pin related to the area of study. Each member of the Shooting Stars 4-H Club submitted a report and achieved their Gardening and Horticulture pins for the 2016-17 4-H year. Shooting Stars 4-H youth maintain butterfly garden. Photo by Elizabeth Murialdo. Awards and recognition are an important component of every 4-H project. Youth respond positively to incentives, awards, and recognition opportunities. This helps youth develop mastery of their project(s). However, not every award needs to be a “blue ribbon”. The Florida 4-H Awards and Recognition model recognizes this through youth’s participation, progress on their goals, achievement through competition, and cooperavtive learning experiences. Any 4-H member are eligible to participate in this valuable learning process – “Standards of Excellence Awards and Recognition”. Your 4-H Leaders or Agents can help you with the application forms which can be found at http://florida4h.org/youth_/awards-and-recognition/group-opportunities/recognition-for-excellence-handbook/. In conclusion, the 4-H project is a tool to assist our youth to become champions of mastery, independence, belonging, and generosity. It gives them the opportunity to develop the life skills to become responsible and productive citizens. The sense of accomplishment that they will obtain through the completion of a project will be a lifelong achievement that they will remember forever. References: Murdock, S. and Costa, C. “Youth and Adult Partnerships.” University of California/ANR. 2017. Andres is the Administrative Secretary to the County Extension Director of UF/IFAS Extension Miami-Dade County. Before starting his current position in October of 2016, he worked for the Dean of Extension office in Gainesville, FL as an Accountant I.